The independent ArtyA brand rolls out yet another amazing rock-star speed machine with its new Son of Sound Racing model, issued in a 50-piece limited edition. These collector’s watches sport classic racing track colours in shades of red, white and black conveying a hint of 1950s tarmac. 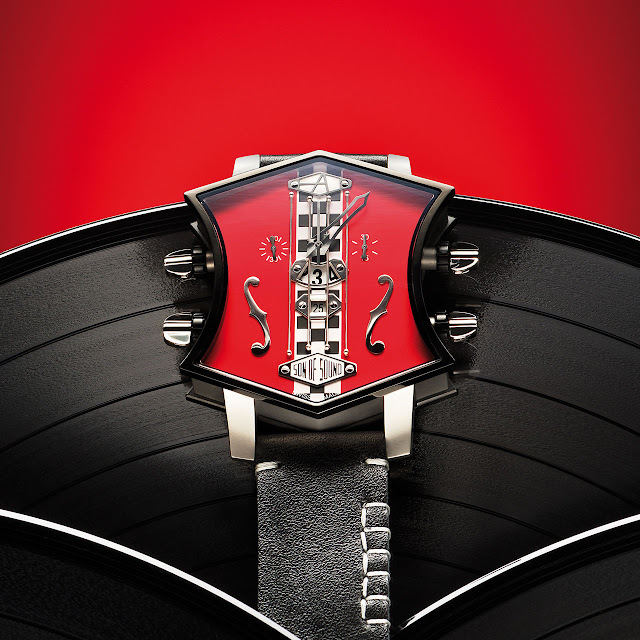 Known for watches bearing no resemblance to others on the watchmaking scene, designer Yvan Arpa wanted to express a “Café Racers” world symbolising an era that saw the birth of rock’n’roll. Its adrenalin-pumping new case sports an uncompromising design including active pegs to tune the date, time and play with the chronograph. All of which is set to music by a Concepto calibre specially adapted to the Son of Sound Guitar collection and naturally christened Woodstock!